Education Secretary Betsy DeVos yet again refused to say that she would act to protect LGBTQ students from discrimination in private schools. She was questioned on Tuesday by Sen. Jeff Merkley on the issue, during a Senate subcommittee hearing, as advocates worry that the funding boost given to private and charter schools will potentially subject more children to discrimination. DeVos talked up the importance of state’s rights and parental choice when asked in a hearing last month if state’s should lose funding if they discriminate. Yesterday, she doubled down on her broken-record rhetoric and refusal to pledge to stand up for the rights of vulnerable students. Merkley told DeVos that the laws around student admissions to private schools are “somewhat foggy” and pushed her for clarity on her position. “Senator, I said it before and I’ll say it again, that schools that receive federal funds must follow federal law,” DeVos said. “On areas where the law is unsettled, this department is not going to be issuing decrees. That is a matter for Congress and the courts to settle,” she answered. Merkley asked her to answer the question, at which time she repeated her statement. The senator then accused her of dodging the question, before suggesting that what she was willing to say led him to believe that she would allow such discrimination to continue. He then asked about discrimination based on religion, and whether that would be allowed for private schools receiving federal funding. 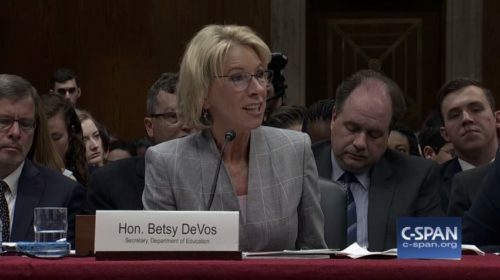 DeVos repeated her line about schools having to follow federal law several more times, despite Merkley’s point about the law being murky in that area, causing him to again accuse her of dodging. DeVos argued that that was not what she had said, and that she is against discrimination. Yet once again, when pressed DeVos remained elusive and refused to promise to protect students based on sexual orientation, gender identity, or religious affiliation. Watch the tense exchange below.